None of the three stories told in my last article related to an avalanche, but it remains the principal danger for snowshoeing. So now, I only plan walks where avalanches are theoretically impossible. This means that we miss out on some of the more exciting summits that I might be prepared to do on my own, but it also means that everybody gets back home, and I don’t spend the weekend stressed out. So where are avalanches theoretically impossible? On a wide, flat plain, evidently. Unfortunately, there are few areas in the Pyrenees that are both flat and high enough for snow but both Capcir and Cerdagne qualify. Even so, despite the relative security of flat plains, there is one significant danger: collapsing snow bridges. 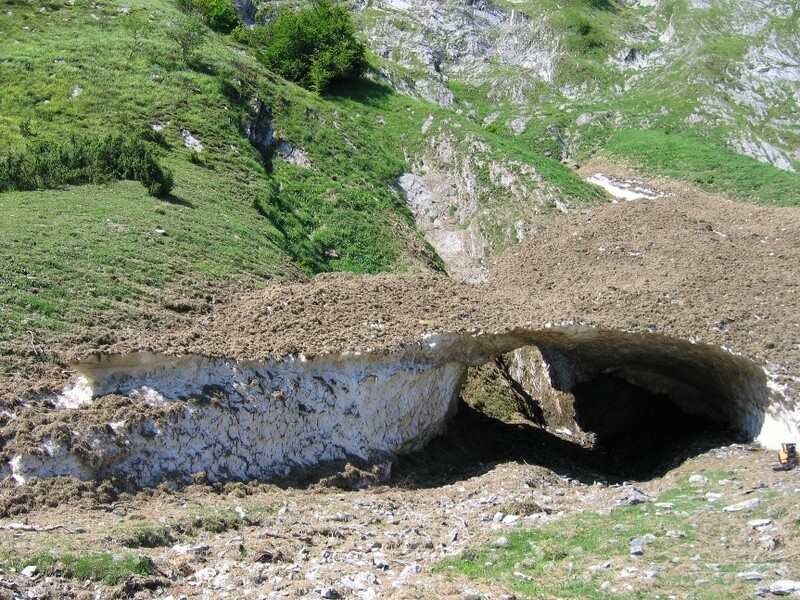 Although most snow bridges are over streams, near La Pierre-Saint-Martin the karst is full of treacherous holes. Snow bridge in the Litor cirque (between Gourette and Arrens-Marsous). This picture was taken in summer but imagine yourself walking here a few weeks earlier when the snow was more extensive, and the soil and bracken completely hid the 4m drop. Thick forest (mature trees spaced less than 3m apart) also provides pretty good protection as long as there isn’t a steep snow-laden slope just above. Stick to the flat or the forest: that was the advice given on both the courses I took but I wanted more details. What exactly is flat? I asked. 10°, 20°, more? I couldn’t imagine an avalanche on a 10° slope. Nobody was willing to give a straight answer, but for the practical part of the courses we were taken out on 20° slopes. So, since then I’ve tried to fill in the gaps, from the Internet. Under 25°, not steep enough to slide. 30–45° avalanche zone. Above 55° self-purging. According to Météo France, the French weather service: “The overwhelming majority of avalanches happen on slopes of between 25 and 45°”. 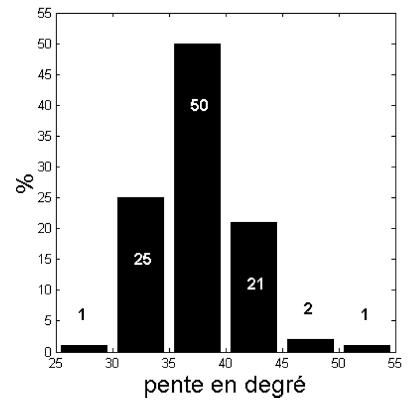 There is a long discussion (in French) on Camp to Camp about minimum slopes. Most people see the lower limit as 25-30°. Only one of the writers, Alex, has seen an avalanche on a more gentle slope. “When the snow is wet (from rain or thaw), liquid water melts the bonds and avalanches can occur on less-steep slopes, even on slopes less than 20 degrees. In the arctic, fast arriving springtime conditions may turn a snowpack to slush, and slush-flow avalanches have been observed releasing on slopes as shallow as 10 degrees.” Source. When there is a very compact and smooth layer of ice below a slab at the beginning of the season (see Alex’s eye-witness account, above). When the snow is saturated with water at the end of the season. Bearing these two exceptions in mind, I consider that slopes of less than 20° are extremely unlikely to have avalanches. So, 20° has become my limit. When looking at slope angle, I consider the following. Slope angle below route. An avalanche on a steep slope may pull snow with it from the ridge above it, where you are walking. Slope angle of hill on the other side of the valley. An avalanche may crash across the valley floor and climb up the opposite side. 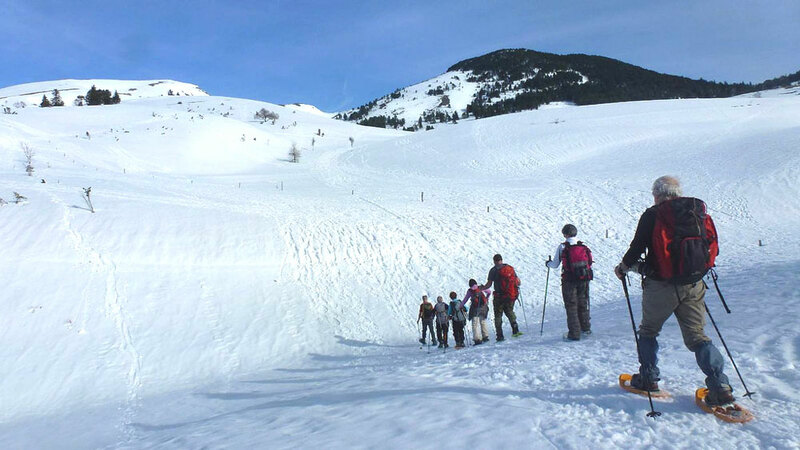 Nine fatal avalanches out of ten are caused by the weight of the walker(s) on the snow. If there is the slightest danger the group should walk 20m apart. Better: avoid avalanche zones. Type of snow (hard, soft, icy) and depth. Patches of ice may be hidden under thin snow. A cornice on a ridge may hide a steep slope. In cloud and in forest, navigation is particularly difficult; snow will have covered the path and waymarks. A GPS is essential. Snowshoeing uses much more energy than walking on the same terrain, up to twice as much. Maximum speed is about 2.5km/hour in good conditions. Walking poles with snow baskets (big discs which fit on the end of walking poles) are essential. Experience and equipment of the group. I create routes on my computer and assess the slopes. There are also free online maps, but it is more work to assess slope angle. If you prefer to work with printed maps, you can buy a slope ruler for 1:25000 maps. Measuring slope in the field. Now very easy with an app. Plan of walk (8.5km). North at top. The Err-Puigmal ski resort has closed down but the road is kept clear as far as Cotzé. 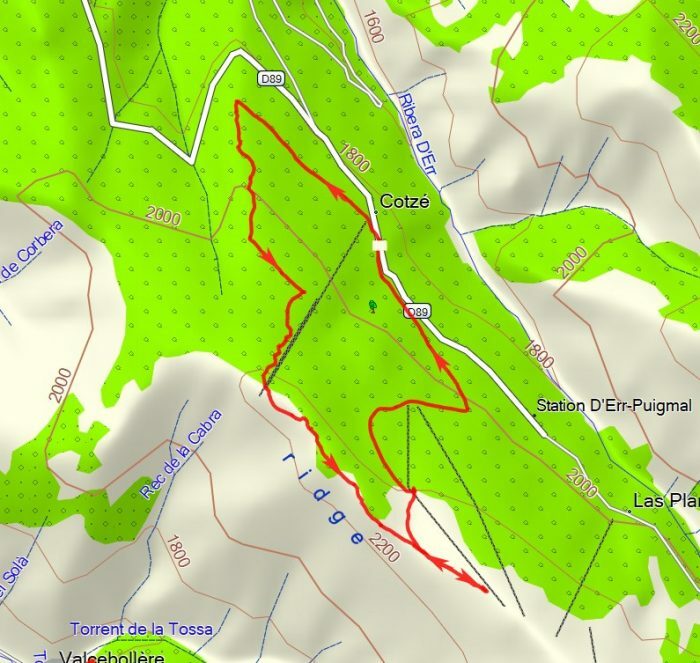 The slopes SW of Cotzé are relatively steep (25°) but are covered in forest, so slope angle isn’t an issue. Marked in red on the maps, the route has a maximum slope of 18° (see below). There was one zone to be avoided: the slopes on the SW side of the Serra de l’Artiga ridge (see below). This is not an exhaustive list. If your company works with professional guides diplômés d’Etat please let me know. In France the Peloton de Gendarmerie de Haute Montagne (PGHM) organises mountain rescue and may give advice. Mountain rescue in Spain is the responsibility of the Guardia Civil (police). In Andorra the Fire Service (Grupo de Rescate de Montaña del Cuerpo de Bomberos) organises mountain rescue. Météo France, montagne. This page also has data for the last seven days, especially useful in assessing the stability of the snow cover. Météo Ciel (France). Météo Ciel doesn’t have a forecast dedicated to the mountains so you need to select the nearest village and extrapolate (about 6°C less for every 1000m, windier the higher you get). The advantage is that rainfall estimates are given in millimetres. 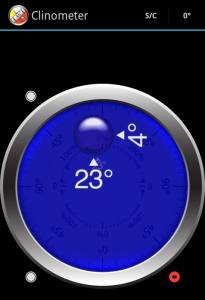 AEMet (Spain) recent weather data. Servei de Meteorologia (Andorra) with avalanche risk assessment. 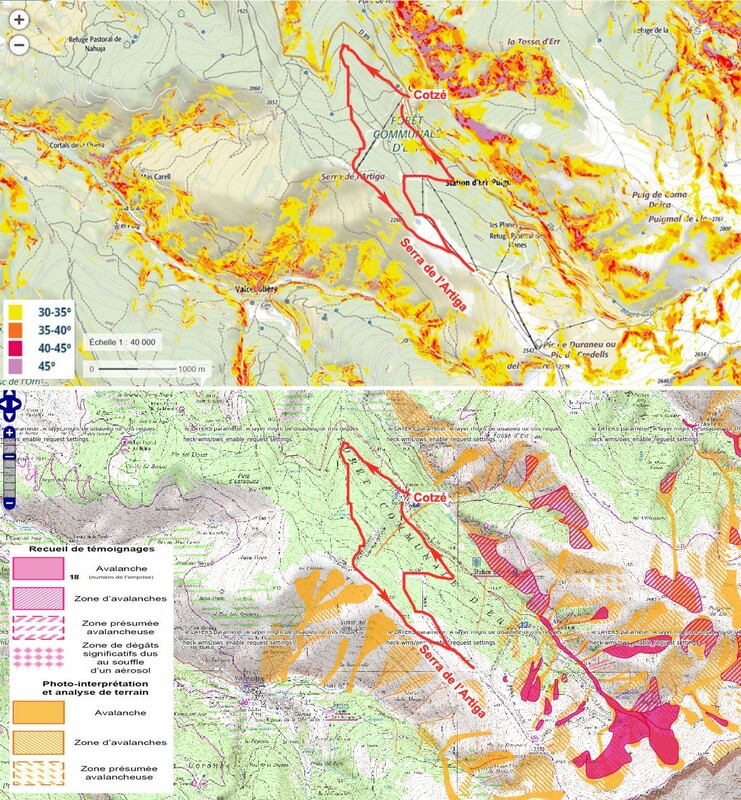 The Geoportail and avalanches.fr maps are very different (see example above)! They both show where avalanches are likely but use different source data. Geoportail shows all slopes of greater than 30°, where avalanches are likely. Unfortunately, 1% of avalanches occur on slopes of 25°–30° and these are not marked. On the other hand, avalanches.fr shows those areas where avalanches have actually occurred (red) and areas where aerial photos and topographic analysis indicate they are likely (orange). The problem with this map is that only areas near ski resorts have been surveyed in any detail. There are no maps for the Canigó massif, for example. This entry was posted on Wednesday, February 28th, 2018 at 12:43 pm	and is filed under Uncategorized. You can follow any responses to this entry through the RSS 2.0 feed. You can leave a comment below, or trackback from your own site.